What is a Great Circle I hear you ask!? Well I didn’t know much about them either UNTIL NOW! So if you are excited to learn new things about circles and sailing, then please dear reader – carry on and be enlightened! 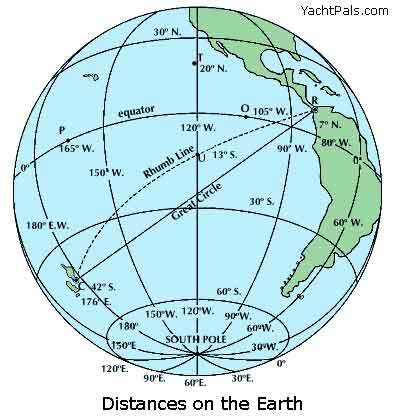 So if you are sailing in North-South directions, a Great Circle route is not necessary to be calculated, as you follow it anyway when sailing along a meridian of Longitude. Same applies if you are sailing around the equator. However… if you are sailing on any other track East or West a rhumb line (or straight line) will be longer than sailing a great circle line. The differences are biggest in long East/West passages in high latitudes. A great circle track also means that you must change your steering course at intervals throughout the passage – usually once a day. So when you plot your course on the chart as a rhumb or straight line – you must then also plot the great circle course and double check that there are no hazards along that track too. For example if you were sailing from Tasmania to Cape Horn then the Great Circle route takes you almost down as far as Antarctica! The distance benefits are huge, however the problem with hitting an iceberg are also a consideration! The way to counteract this is to plot your rhumb line, calculate the great circle track, then plot a composite GC is positioned at a safe latitude – so the vessel follows the great circle route to start off with, then cuts across the composite line and back up the great circle again at the end. Many GPS’s will calculate the great circle route for you automatically. There is a way of figuring it all out manually, and there are also wonderful computer scripts written on how to do it as well. Another easy way of plotting a GC route is on a Gnomonic chart. A Gnomonic chart is where the meridians appear as straight lines all converging towards the nearer pole and the lines of latitude appear as curves. This is different to a Mercator chart which is what we usually use for navigating. A great circle can be drawn as a straight line on a gnomonic chart and then plotted as a circle on a mercator chart. Note how the GC line on the picture below shows as a straight line? Well that is because it isn’t plotted on a mercator chart. Here is another example showing the difference between a Gnomonic chart vs a Mercator Chart. A lot of long distance aircraft use this too. Sounds like you’re enjoying your course! Yes of course! I did always wonder why the flights took odd paths around the world when you are watching the flight track thing… well now I know! Good description and globe. Good luck in your class. Enjoy the course—looking forward to more posts! Thanks Ellen! It is good to get the brain working again trying to work out all the mathematical stuff. I now wish I had paid more attention in high school maths! At that time I thought I would never need to use trigonometry!